BAM! Direct specializes in direct response marketing for business-to-consumer and business-to-business organizations. We will work with your company to understand your goals, objectives, budget and timeframe, offer recommendations based on your parameters, and craft a comprehensive direct marketing plan best suited to meet your business needs. Our focus, experience and knowledge rest in direct marketing. Our principals have worked for some of the finest direct marketing and advertising agencies in the country - consistently ranked in the Top 10 for strategic and creative abilities. BAM! Direct offers the abilities of these agencies, without carrying the massive overhead and the too-many-layers of people servicing your business. You need a few good people focusing on what you do. We are lean, smart and very experienced, by design. Our team has deep corporate experience as well, which gives us, and you, a unique advantage. By combining both agency and client-side experience, you receive perspective that is complete. Tom has 25 years in direct marketing to his credit, and those who know him say he's seen it all. Tom's area of expertise is Production - printing any format, on any material, at any quantity. Tom began his career with McCann-Erickson in Seattle. He then headed east to Bozell Jacobs in New York, where the Account Management group was attempting to solicit him, due to his solid work ethic and attention to detail. Tom went on to manage production for some of the most well-regarded direct marketing agencies in the country, including Ogilvy & Mather Direct, NW Ayer, Martin Direct, and WestWayne in Atlanta. As Director of Production for the Database Marketing Group of WestWayne, Tom was charged with assembling a functioning direct marketing group within the general agency. He did, which helped him refocus on his long-time ambition of having his own direct marketing agency. Tom is one of the original founders of BAM! Direct, and oversees all printing and mailing projects. Kim has been involved with website development since the beginning of the World Wide Web. She holds a BFA with an emphasis in computer graphic design, and has been designing ever since. What makes Kim exceptional, and a valued leader of the BAM! Direct team, is her ability for beautiful web design that is effective, functional, and user-friendly. She is able to accomplish this with her deep knowledge of web programming, architecture, and web application. Basically, Kim can create anything from an informational site to e-commerce, and our clients appreciate her savvy. Kim’s background is in developing multimedia training materials for the US Navy that involved 3D animation, interactive schematics, interactive questionnaires, and online training materials. Kim was also a Project Manager with the AT&T Web Factory, where she managed development for online web applications and online training units, on behalf of internal AT&T business units. Kim’s entrepreneurial spirit led her to BAM! Direct, where she has managed the Web Development team since day one. Work with a company who specializes in direct response marketing. 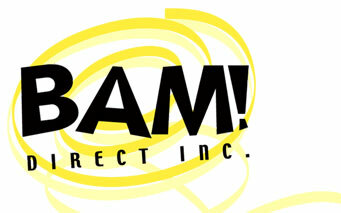 Get more out of your direct response efforts with BAM! Direct. Contact us today.